Buttery, flakey puff pastry sprinkled with Gruyere and topped with creamy slices of potatoes makes for an indulgent and delicious treat! This tart comes together so quickly but really packs a lot of visual punch for the effort making it a perfect dish for entertaining. I loved this with a healthy sprinkle of sea salt flakes but you can add any of your favorite herbs and switch the cheeses up as well. A while back I had an amazing pizza with slices of creamy potatoes covering the top, so delicious I was inspired to make this tart! I thought a fish scale pattern would be easy to render given the shape of the potato slices and it was! 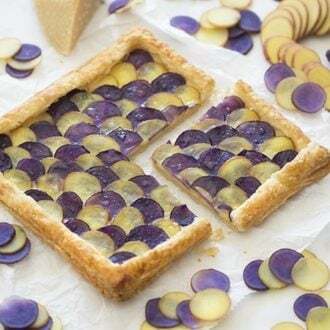 Alternating between the purple and white slices definitely adds a lot of visual interest but this will still look great if you only have one color of potato to work with. Using baby potatoes will give you the best sized pattern. Large potatoes are just too large for this size of tart. I used a ruler to get a perfect border for this tart. Cut a square shape then use a knife to carefully cut a border 1/2 and inch in by pressing the knife half way through the dough. Keep a close eye on the pastry when you’re baking. If your oven heats unevenly you should turn it halfway though baking. If you don’t want to break a ruler out you can get the exact same taste with a more rustic look by just eyeballing the pastry dough. Preheat to 400 degrees F. Par boil the baby potatoes until tender. Flour a surface. Roll out a sheet of puff pastry. Using a ruler, trim the pastry into a square. Transfer to a baking sheet with parchment paper. Score the dough about 1 inch from the edge. Thinly slice the potatoes. Parboil the white baby potatoes slices for a few minutes or until tender. Repeat the process for the purple potato slices. Use a fork to pierce the inside of the scored square. Bake the shell for about 10 minutes. Use a sharp knife to thinly slice potatoes. Grate about 1/2 cup cheese. Take the pastry shell out of the oven and add the shredded gruyere. Arrange the slices so that they alternate white and purple pattern. Brush with olive oil and sprinkle sea salt. Bake for 15-20 minutes. An easy and oh so satisfying potato tart filled with Gruyere cheese. The simple design scheme of alternating white and purple potato slices creates a striking effect perfect for entertaining. Preheat to 400 degrees F. Thinly slice the raw potatoes. Slice the white nParboil the white baby potatoes slices for a few minutes or until tender, remove and set aside on a paper towel. 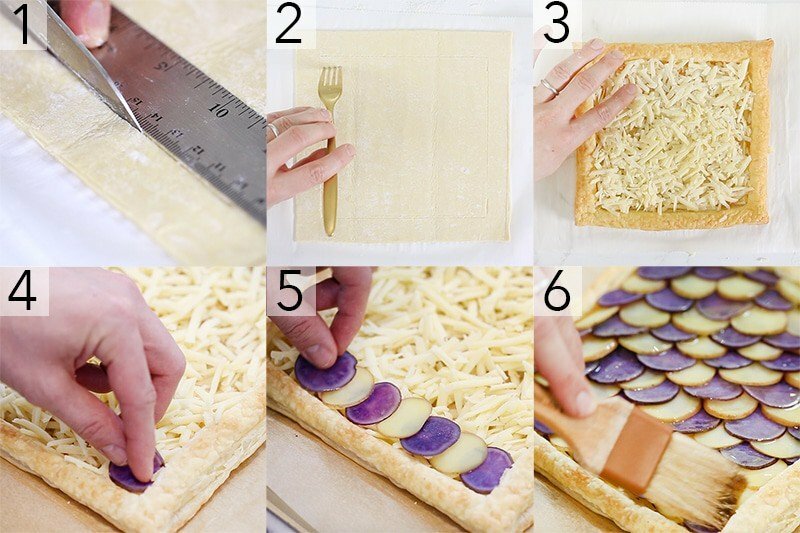 Repeat the process for the purple potato slices. Flour a surface. Roll out a sheet of puff pastry. Using a ruler, trim the pastry into a square. Transfer to a baking sheet with parchment paper. Score the dough about 1 inch from the edge. Using a fork, pierce the inside of the scored square. Bake the shell for about 10 minutes. Grate about 1/2 cup cheese. 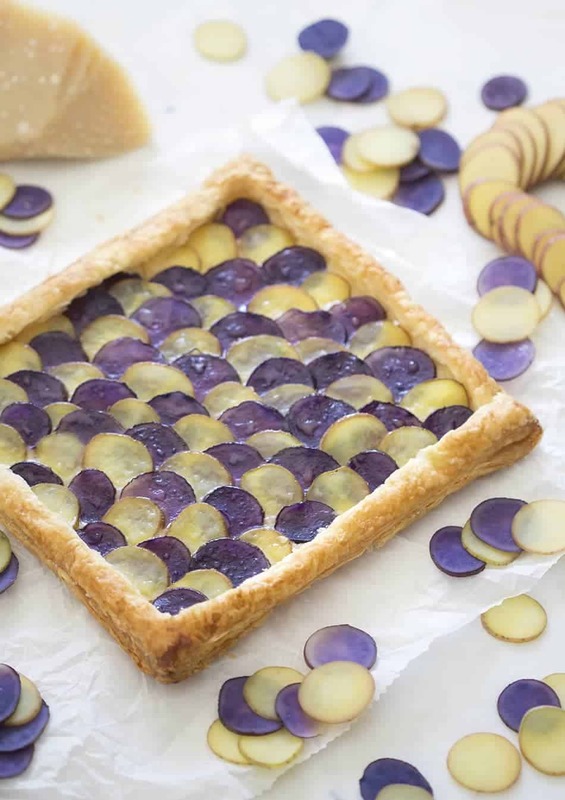 Arrange the potato slices so that they alternate white and purple pattern. Brush with olive oil and sprinkle sea salt. Keep a close eye on the pastry when you're baking. If your oven heats unevenly you should turn it halfway though baking. This was CARB HEAVEN! Mine wasn’t as pretty but it tasted delicious. Thank you so much! I’m glad you enjoyed the pizza, it really is a slice of heaven! This is an amazing tart – made it for brunch today and love the combination of gruyere, potatoes and puff pastry – was a bit worried about the latter, since I never made anything with puff pastry sheets, but it turned out really well. I only used yellow baby potatoes, as we don’t have purple around here, added a bit on onions and scallions, and some grana padano cheese on top, and it was incredibly delicious – thank you so much for the recipe! I love this dish! What a good idea on your part to make it for brunch! I’m so glad it was a hit and thank you for your feedback! !